When putting together your ideal business phone solution, you should definitely consider fax as well. Fax remains an integral part of day-to-day business communications and is responsible for sending important documents between companies. That’s why as part of our aim to help you create a full-featured business phone solution, we created Hoiio Fax. 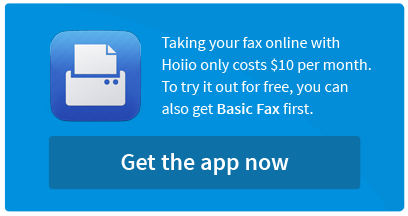 Hoiio Fax is a cloud-based fax app that sends and receives fax online. Every incoming fax is sent straight to your email inbox, allowing you to forgo the physical fax machine. This makes it a great solution for companies looking for fax solutions that are inexpensive and quick to set up. The fax to email feature allows you to effortlessly retrieve fax documents from your desktop and other mobile devices. This means that access to your fax is available even when you’re on the go. Fax can be forwarded to colleagues as easily as with email. And because the fax is sent directly to your email, you run little security risk when sensitive and confidential documents are sent your way. The thing about business fax is, in the event of your fax service terminating, it can be a huge hassle to update all your business counterparts with your new fax number. To help you avoid the pain of changing business fax numbers, we offer free number retention service for local numbers. Hoiio Fax is flexible. You can use it wherever you are, be it in the office or at home. It is therefore suitable for entrepreneurs who work from home and don’t have full-fledged office equipment. The app also comes with lifetime digital fax archiving. With every email that enters your inbox, your fax is automatically archived. This way, you don’t have to worry about keeping a record of all your fax documents because Hoiio Fax does it for you. If you have any queries regarding fax-to-email or our number retention service, please contact our sales team at +65 6591 8887.